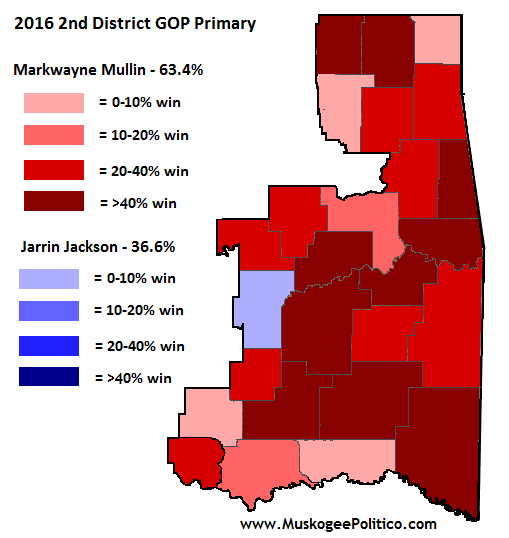 For the latest installment in my Election Results Maps series, here's the 2nd Congressional District Republican primary. Markwayne Mullin won every county except Hughes County, and was held under 56.5% in 6 other counties (Bryan, Choctaw, Johnston, Muskogee, Ottawa and Rogers). Mullin's best county was Adair County, where he received 85.6% of the vote. He got over 70% in ten counties.